The recently opened three-star ASTORIA HOTEL is located in the old jewish district of Kazimierz in Krakow, from where all major places of interest in the centre of the city are conveniently reachable on foot. conference room,sauna and fitness room. We provide assistance in purchasing tickets for local excursions organised by well known travel agencies. The hotel offers guarded parking lots in own underground garage and an outside parking lot for coaches. 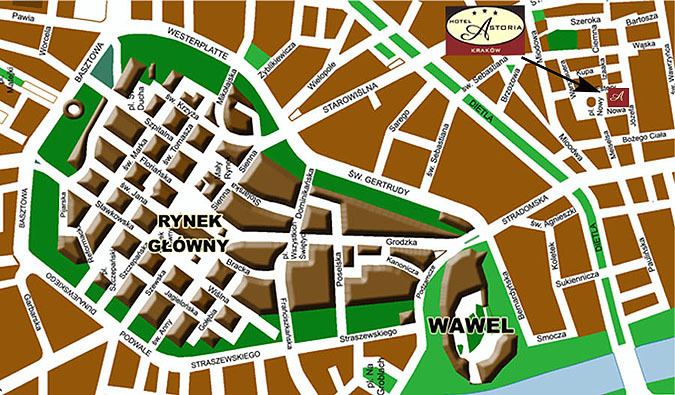 The hotel is situated 1,5 km away from the city center of Krakow, 1,5 km away from the main railway and bus station. the airport is 12 km away from the hotel. The hotel may be reached by trams no. : 10, 13, 3 or taxi.